The web page for our Harvest Moon Dinner and Casino Night has been launched. On the web page you can learn much more about this fantastic event coming on Saturday, October 22, 2011 at Hecker Pass Winery. In addition, you can order tickets online, or find a local Morgan Hill merchant who is a ticket outlet. Be sure to visit this web page and learn about the Harvest Moon Dinner and Casino Night. Only 500 tickets will be available in the drawing for the award-winning quilt "Rosebud Lane" donated by Rebecca Lister, a well-known local quilt maker. While there is no charge for a ticket, the requested donation is $10. Tickets are available online or from several locations right here in Morgan Hill. The actual quilt is on display at Quilts and Things, 16985 Monterey St. #316 here in Morgan Hill. The drawing for the quilt will be held at our Harvest Moon Dinner and Casino Night, Saturday, October 22, 2011 at Hecker Pass Winery. You need not be present to win. For more information about the raffle, to view an image of the quilt, or to make a donation for tickets online, click here. For tickets ordered online, we'll even fill out and deposit the ticket stub(s) for you and mail the ticket(s) to you. All proceeds benefit the Centennial Recreation Senior Center. Friends of the Morgan Hill Senior Center is part of the Morgan Hill Community Foundation, a 501c3 non-profit public charity. Thanks to the Kiwanis Club of Morgan Hill, Boy Scout Troop 799 and Pacific Corporate Solutions for helping us have a very successful eWaste Event held on April 9, 2011. 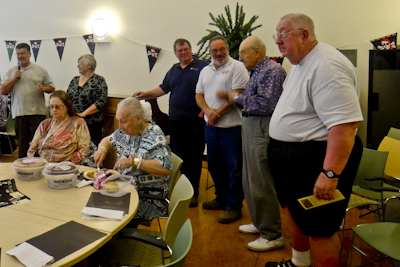 We were pleased to have five of the Kiwanians attend lunch today, April 28th, to present the check (and cash) to Friends of the Morgan Hill Senior Center. The actual amount paid by John Varela's company, Pacific Corporate Solutions was $2,480.96. It really bothered Anthony Goularte that it hadn't hit $2,500, so out of the generosity of his heart, he kicked in another $20. from Friends of the Morgan Hill Senior Center. We also thank Nob Hill Foods for stuffing flyers into grocery bags and to Thinker Toys for offering a 40% off coupon to those donating eWaste. Pictures of the event go to the "Events" menu item. It is important to thank the Friends of the Morgan Hill Senior Center volunteers who passed out flyers to Morgan Hill businesses and helped market the event which led to its huge success. They are: Sheila Hill, Jeanetter Riley, Cricket Rubino, Linda Tarvin and a youth volunteer, Jonathan Davis. Be sure to visit and explore the Friends of the Morgan Hill Senior Center website. We've just launched our email subcription and management feature on the Friends of the Morgan Hill Senior Center website. For your protection, when you subscribe you will be sent a return email with a link. You MUST click the link to validate your subscription request. Then, your email subscription will be confirmed. You can also unsubscribe and change your email address here. You can subscribe right now by clicking here. 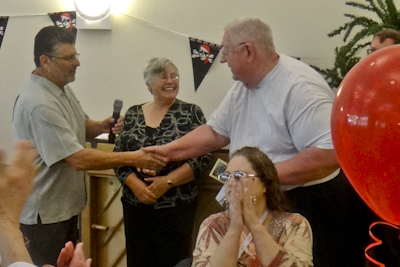 The Women's Group of the Morgan Hill United Methodist Church sent a check to Friends of the Morgan Hill Senior Center for $500 as a donation to the Senior Center Endowment Fund. This generous donation will help to sustain the Centennial Recreation Senior Center in years to dome so that it can benefit tomorrow's seniors as well. Friends of the Morgan Hill Senior Center submitted a request for a Community Grant from the Rotary Club of Morgan Hill. 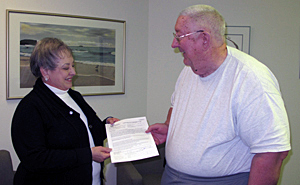 John Tarvin presented the request to the Rotary Club's Service Projects Director, Linda Sanborn. Funds requested in the grant will be used to hold a recognition event for the more than 100 volunteers who make the Centennial Recreation Senior Center a reality. A small portion of the funds will be used to purchase recognition plaques for donors who become Associates of the Friends of the Morgan Hill Senior Center (See Associates menu item above). The recognition plaques are planned to be displayed in the lobby of the senior center. The application period for grants is now closed. We should know the outcome of our application by early July. We can now link to our Facebook page from the website and this blog. Thanks to the 26 folks who "liked" our Facebook page. It takes 25 "likes" before you can assign a name to your page. If you want to include a link to the Friends of the Morgan Hill Senior Center on your web site or blog just make a link to http://www.facebook.com/fmhsc and that will do it. The coffee was hot and flowing and there was the yummy breakfast of scrambled eggs, sausage, pancakes and syrup. Chilled orange juice and a nice fruit cup accompanied the meal. The Kiwanis Club of Morgan Hill must have gotten out of bed early to come to the Centennial Recreation Senior Center and prepare this free breakfast for seniors in our community. Breakfast was being served from 8:30a.m. until 10:30a.m. Susan Fent, Director of the Senior Center was there working. Cricket Rubino and Jan Hagemann, both on the Mt. Madonna YMCA Board of Managers were there as well. Cricket is also active in the Friends of the Morgan Hill Senior Center. There were lots of seniors in attendance. Everyone was enjoying themselves and having a nice time visiting. There are more photos on our website. There is a link to the website in the sidebar to the right under "Worthwhile Links". We also want to thank the Kiwanians for being a major sponsor of our eWaste event which is going to be held on Saturday, April 9th from 9:00a.m. until 3:00p.m. For more information click here. Yesterday evening was our regularly scheduled Senior Center Growth & Development Committee (SCGDC) meeting. We were pleased to have Lou Mirviss and Danny Wan join us. Lou is an expert in marketing and sponsorships and Danny has experience and is still serving on a senior center board of directors in Oakland. One major thrust of this meeting was to start promoting the eWaste Collection Event which will be held on April 9 in the Vineyard Town Center parking lot. You can find details on our website. Promotion will be done at retail merchants, on MHAT Channel 19, residential door-to-door and at the Centennial Recreation Center. Another major area is building the endowment through planned giving. Senior Center Director, Susan Fent, will be setting up partnerships with local professionals to help spread the knowledge about our endowment which will help sustain the Centennial Recreation Senior Center in years to come. The committee has begun the planning process for a major fund raising event in the fall. We need more volunteer committee members to help bring this event to fruition. If you are interested in helping plan and execute a major fund raising event, please email us. Our next regularly scheduled meeting is on Tuesday, April 19th, 5:15pm until 6:45pm at the Centennial Recreation Senior Center. John Tarvin met with the Morgan Hill Community Foundation board of directors and established the Friends of the Morgan Hill Senior Center named fund. John also joined the MHCF board. Being a part of the Morgan Hill Community Foundation allows Friends of the Morgan Hill Senior Center to accept tax-deductible donations. Well, it took a while but John finally got the background colors to match those used on the website. Setting up your own template is NOT the easiest thing in the world to do. John will be adding some photos and additional links to the blog page. The intended purpose of this page is to be able to share news quickly without having to go through the pains of modifying the web site. Later, we'll get a FaceBook account set up which will provide opportunity to output real time events.